I love this (below) that I read on your web site. Just as I have felt for the first time in my life that I have been washed from my sins, with the baptism of the holy Ghost. The spirit has told me many things that I need to do, from starting over and to live a life of righteousness, and to STAY THAT WAY! My dear brothers and sisters, you were perfect with God in the beginning of your walk with Him. To be prepared to meet your heavenly Father in peace, you need not become anything more than you were then because what you were then is what God Himself made you; it was not your work or that of your earthly parents. You were washed from all your sins by the baptism of the holy Ghost, and you were perfectly clean before God. You were willing then to be changed, to be molded by God\’s tender hands, humbly willing for others to be right and you to be wrong, and hungry for God’s righteousness. STAY THAT WAY! Do not become anything else because everything else is sin. Paul said, “As you have received the Lord Jesus Christ, so walk in him.” Amen! This continuation in righteousness is called in the Bible, “faithfulness”, and no one will be saved without it. This weekend’s Revelation study was wonderful! It is astonishing what the Lord is revealing through the study. For me, it puts a whole new light on who the harlot (Babylon) is that is being talked about in Revelation 17. I have always pictured it as something the world was doing, separate from God’s real people, not realizing whose fault it really is. Yes it does sound a little self righteous, and maybe you’re not, but your tone can be miss leading. I don’t agree with some of your findings, but I do agree that one will speak with tongues when they receive the baptism of the Holy Ghost. Self-righteousness is what we can do for ourselves without the Spirit, such as practice ceremonies and dress up our flesh with religious clothing, and baptize with water, etc. It is God’s righteousness that will save us if anything does. Hopefully, my tone in saying that does not come across as ungodly in any way. Please do not my plain speech with arrogance. I am just trying to be understood, sir. I think some things will not matter such as whether one wears a robes or not. No, it doesn’t affect whether or not your heavenly Father, or anyone who truly knows Him, loves you. But it dishonors Christ, just as other religious ceremonial acts do. It does this by saying, in works rather than words, that the robes which Christ purchased for us with his blood, the robes of righteousness and praise, are not enough to satisfy us. It is wiser, and it pleases the Father more, if we honor the Son by letting him put on us all the religious clothing that we need. I do believe in sanctification living a holy Life after the example of Christ. Amen! And may God increase our power and knowledge to do that together, for His glory! Truth is Judge not that we be not judge Matt 7:1. That commandment is no more the truth than is this one: “Judge righteous judgment” John 7:24. It seems that you judge a lot in your teachings. I judge every situation and every person I meet every day, and so do you. The only issue is, do I judge after the flesh and, so, break Jesus’ commandment of Matthew 7:1, or do I judge after the Spirit and, so, keep Jesus’ commandment of John 7:24? Moreover, if we truly are men of God, then the words we speak are truly from God (Jn. 3:34), and those words judge every person who hears them, just as Jesus’ words did (Jn. 12:48). They are judging you right now. You are not judging them. Argument is fine. It’s quarreling that God hates to see His children fall into. but when you say all these things are wrong how can one be filled with the Holy Ghost? And I know for a fact that several people that I fellowship with are filled and have spoke as the spirit give the utterance. So what I am saying is this, if all these things you say are not the way or what every you call it. Why do other possess the Holy Ghost and yet enjoy just as you??? Because we receive the Spirit through faith, not through knowledge. There is no one who knows God when he first receives the Spirit. There is no one who knows good from evil (as he should know) when he first receives the Spirit. That degree of discernment belongs only “to those who are of full age” (Heb. 5:14). You say you have truth They say they have truth I think the bible is truth. But the Bible says that “the Spirit is truth.” And that is all that I am trying to get you to understand. Whatever form of worship is not of the Spirit is in the flesh, and the flesh has no part of worship in this new Covenant. I think what he said was “Do THIS [what he was doing] in remembrance of me”, not “Do that [what the disciples were doing] in remembrance of me. My book, “Spiritual Light would explain this for you in some detail. You can find it, I believe, at www.GoingtoJesus.com. The Lord’s Supper was not the eating; that was the disciples supper. Its the only kind of supper they could have with the Lord because they did not yet have the Spirit. The book would explain all that for you, as well. But I will say here that Romans 6 has nothing to do with water. Paul didn’t preach that baptism for the Gentiles. Then you talk about Christians according to what I read in Acts 11:26 speaks of the disciples being called Christians first in Antioch how can you say that Christianity is the worlds system? But it does not say that the disciples called themselves that, and God never did. It was a term of ridicule, and Peter told the saints to rejoice if the world labeled them that way. The world cannot be Christians the two are contrary one to the other. Satan’s most successful lie in history is that if we belong to Christ, then we are a part of Christianity, the religion he invented after the days of the apostles. That lie has deceived the whole world, including every one of us who have loved Christ. But Jesus is liberating his people from that blindness. When he calls to his people to “Come out of her”, he is calling them out of that abomination that they have joined in the flesh, out of ignorance of what is truly right and wrong: Christianity. Now I do know that many PROFESS to be Christians and are far from being Christ like. But we cannot discredit true Christians because of the world or false prophets etc… And start teaching our own opinions. Catholicism is the original Christianity, and the daughters of that mother of harlots are the Protestant sects that came after her. The common foundation for them all is that they all hold that a person can be born of God without receiving the baptism of the holy ghost. And every man who is teaching that doctrine is antichrist (1Jn. 4:1-4) and is working for Christianity and against Christ, even if he does not yet know it, or want to be. I like some of your teachings and think that it could be real powerful in a day that we live, but I don’t think one person know it all. Amen. But if you know anything that will help me, I know I am willing to change. I have done it many times already, as Jesus has corrected me. Nor do I believe that God is only working in your fellowship and the Kentucky Fellowship. God is not that small. He everywhere at the same time. I never suggested any such thing. It is insulting that you suggest that I did. I know that God is everywhere, and I know He is using many men to bless His people everywhere they are. But I also know that He is here. And He has taught me things that, though hard for you to understand, are nonetheless true. And you would do well to stop resisting these things and take some time to pray about what I am telling you because they came from God. Questions: have you ever did a study of where the garments came from? Seriously, ministerial vestments and the like were given to Israel’s priests and Levites until the Spirit came. Since then, God has ordained no such thing for His ministers. Or why they wore them in the early day churches? No apostle wore such clothing or ever suggested that anyone else should. Ministers in early Christianity did it because the religious system of Christianity is not of God. Is it any surprise, then, that ministers in Christianity do things that are not of God? Also how do you dilute truth? Wouldn’t truth be truth or if diluted it wouldn’t be truth? You can mingle truth with lies, as Satan did to Eve, and as he is doing now, through ministers who do not know God yet. I will leave it to you to decide whether or not those who are feeding God’s people tainted meat “thinking to do God a service” are preaching the truth. Bishop Elect George E. Moore, Sr. I hope in the blessing of the Lord, both for me and for you, and for all of God’s divided children. Please tell me if there is a group of people somewhere in my area that could be fellowship for me. I live in Gulfport MS on the Gulf Coast. My spirit tells me that every word I am reading is true. I have the baptism in the Holy Ghost since 1980 and once attended a oneness church like UPC. I have always felt most churches just had to be getting some things wrong. Now, I know why. Thanks for any help you can let me know about. I really do miss fellowship but I just can’t attend the mainstream churches anymore. You have no idea how many emails I have gotten just like yours over the years. I wish I knew of a place in every town in every country where God’s children are fed the unadulterated truth. But we rejoice just to hear a voice like yours who can even recognizes the truth when they hear it! As a result, we have people who drive/fly here from places across the country to be in our meetings and to visit, just to be fed a meal that is not tainted, to experience the glorious fellowship that is in a body as a whole that is walking in the light, and just to be refreshed. One man even moved his family here from Australia to help us get this message out. He is the web master of the web site www.goingtoJesus.com. I have known some ministers who were taught the truth, but they were either afraid to teach it for fear of losing their job, or they refused to believe it. But as for a group of believers anywhere who are walking together in the light, other than here and in Louisville, KY, I haven’t found one yet. We will send you some CD’s from our meetings if you would like to hear them, and of course, if you are ever in this area, you are more than welcome to come visit us! You are not saying that Louisville, KY is the only place that the truth is being taught are you??? 1) Every person in a congregation understanding that the baptism of the holy Ghost, with the evidence of speaking in tongues is the new birth — and rejoicing in that knowledge. 2) No ceremonies are ever practiced, but God is worshiped only in spirit and in truth, as the Lord said. This includes such ceremonies as water baptism (“There is one baptism”), ceremonial meals (our communion is in the holy Ghost). 3) No holy days observed, for Christ put the holiness within us, no on a calendar. 4) No specialized religious garments to set apart one man, or a group of men or women, from others, including choir robes. 5) An anointed leader guides the congregation, and no titles granted by a religious organization. 6) Every member renders his tithes to God and his offerings without being begged for it. 7) No ministers are hired or fired. The Christian system of hiring and firing ministers is of the world, not God. Hope this gives you an idea of what I am talking about when I say it is difficult to find a place where the UNADULTERATED truth is taught and enforced. Do you have such a place where you are? Share your thoughts or what you feel is going on with our current president and the new law that was just passed? I refuse to have any thoughts about it. It is not the business of the saints as to what sinners of this world do with their countries. God will destroy both it and them, in His time. It’s best for God’s children to stay out of political controversies, and we should never take sides with one party against another. Jesus called king Herod a “fox” one time, and so, we do not have to play dumb. In Christ, we can judge the character of all men. President Obama and his underlings have designs on this country that would take it toward a European model of government, but as to what model of government this nation’s rulers choose, that is in God’s hands, and we should stay out of it. Stay away from the political partisanships of earth. Those who take up the sword will die by it. All that is necessary for evil to [prevail] is [for] good men to do nothing. I didn’t say do nothing, Jeff. I said stay out of politics. What are the seven spirits of God? The “seven spirits of God ” are seven creatures who dwell in the very presence of God and are sometimes sent to accomplish the will of God on earth. Very, very little is ever said about them. That’s why you cannot trust anyone who claims to have a lot of insight into who they are. They may be those seven living flames that are before God’s throne, but even that is not certain. Significant Point in US History? I don’t understand the theories involved, but I feel sure that something must happen. What it will be is up to God. Could it be the Balances being held in the hand of the one riding the Black Horse of Revelation 6? Following is a graph that is not difficult to follow. It shows the change in US GDP (Gross Domestic Product) for each extra dollar of Federal debt incurred since 1966. I’m no economist but I have learned that each dollar “created” by the Federal Reserve enters the economy as debt against the Federal government. 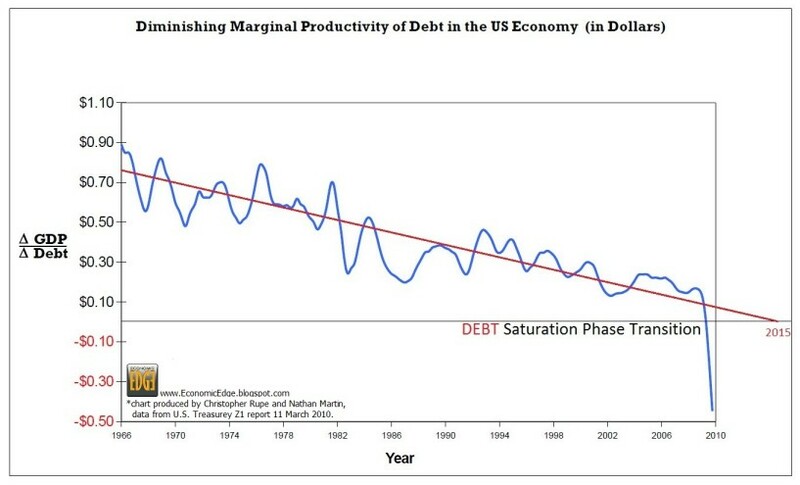 What the graph shows is that during the last 6 months of 2009 the US economy reached the point where increasing the debt was associated with a shrinkage of the economic output of the country. In the recent past the US government has worked on the premise that incurring debt and running budget deficits was OK because it grew the economy and thus (in theory possibly) the ability to repay. I have heard congressman in the last year say “deficits don’t matter”. Well if this graph holds true and something remarkable does not occur soon then the deficits or “stimulus” spending of “created” money, which is actually more debt incurring interest, will result in continuing and devastating implosion of the US economy. This years projected deficit of around 1.5 trillion could result in a GDP reduction of 675 billion (~5%) based on the last quarter 2009 figure of -0.45c per $ of debt. Such changes will act to rapidly increase the ratio of debt to GDP towards the levels that small countries in the news of late such as Iceland, Ireland and Greece are facing. If this continues for long at all and the Government continues to increase the debt something will surely have to give. If the US credit rating drops from AAA interest rate rises could destroy the economy even more rapidly. Somehow I don’t anticipate this happening just yet. Maybe it will but I really rather wonder that we are going to see something really startling coming up in the next period of history. In any case this strikes me as a pivotal moment in US history. The US economy in current form can no longer presently utilize debt effectively at all. More debt is dragging it down as the repayments become too much to bear. At the same time the government is spending big and receiving diminished tax income. You and I can’t budget that way!